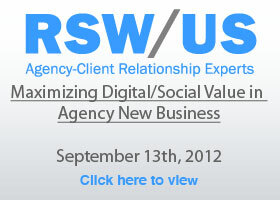 In the 4th webinar of our RSW/US Summer series, RSW/US Director of Business Development Lee McKnight Jr gives three reasons why your agency should stop using social for agency new business and dig deeper into findings from our 2013 RSW/US Agency New Business Thought Leader Survey Report. 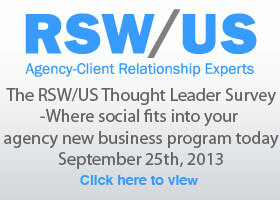 Lee also touches on questions asked by thought leaders Michael Gass and Jay Baer from our survey, on topics including SlideShare and why it can be so helpful to your agency new business program, and how the newly expanded LinkedIn profile pages work and can add another layer to your new business program. And finally, Lee addresses specific responses and questions from agencies relating to social and content and the realities of their place within a complete, and successful, new business program. 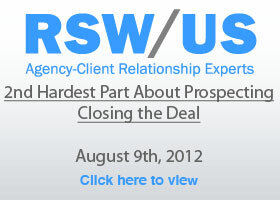 Slide deck on RSW/US Slideshare page. 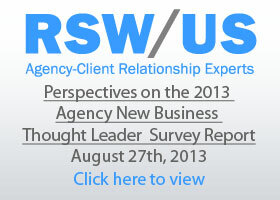 RSW/US Director of Business Development Lee Mcknight Jr. discusses slideshare findings from our latest survey report, “The Definitive Guide to Agency New Business Tools,” created with Mirren Business Development. 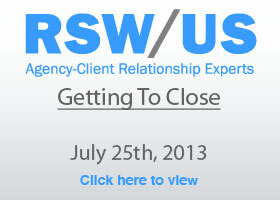 More specifically, with so many tools available, Lee discusses the 4 key tools RSW/US recommends for agencies when time and budgets are limited (and they always are). 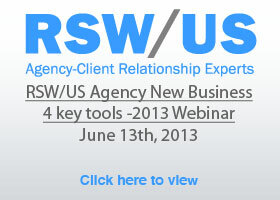 This webinar is ideal for those agencies looking to strengthen or re-start their new business efforts or for those with programs in place, on the lookout for new tools or the tools agency colleagues are using most often and find successful. 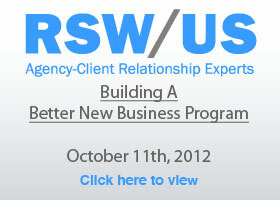 Mark Sneider outlines a best-in-class process for building a better agency new business development program – from hiring to closing. 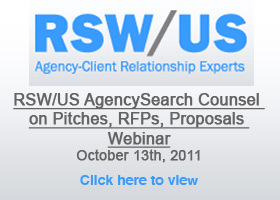 Our Thursday 10/11 webinar is now online and available to view.